Ремонт автоматических секционных ворот CAME. In the late 1890s, on the threshold of a new century, a remarkable new star appeared on the Russian musical horizon. Alexander Nikolayevich Scriabin attracted the attention of his contemporaries by a diversity of intellectual and artistic pursuits - as an innovating composer who drastically expanded the range of music, as a musician-poet and musician-philosopher who asserted the ideals of goodness, light and universal brotherhood. A unique personality of this musician is intimately associated with the epoch of revolutionary outbursts which took place in Russia in the early 20th century. The central image of Scriabin's music is Prometheus, who, according to the Greek myth, stole fire from heaven and gave it to mankind. We feel an affinity with this image and with Scriabin's music which celebrates man's artistic powers. meet his talented pupils, among whom was Sergei Rakhmaninov; then studied at the Moscow Conservatoire with such outstanding musicians as Sergei Taneyev (composition) and Vasily Safonov (piano). Scribain's reputation as a pianist and a composer was steadily growing. His works were regularly published and performed, and since the late 1890s became standard items in concert programmes in Moscow and Petersburg. At that time he established a close relationship with the Petersburg composers Nikolai Rimsky- Korsakov, Anatoly Lyadov and Alexander Glazunov. His music attracted the attention of the famous Russian art critic Vladimir Stasov. The noted music publisher Mitrofan Belayev became his close friend and patron. The early 1900s were marked by Scriabin's profound interest in philosophy. He made a careful study of works by Schopenhauer, Nietzsche and Fischer. His philosophical views were to a large degree shaped under the influence of the Rector of the Moscow University Sergei Trubetskoi, a prominent philosopher and journalist. The idea to extend the philosophical programme of his music became predominant in Scriabin's mind. The years from 1904 until 1910 were characterized by his tremendous artistic insights and discoveries. During that period Scriabin developed an innovatory idiom, particularly in the field of harmony. 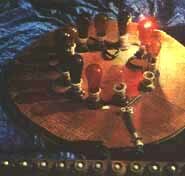 He dispensed with the traditional major-minor system and evolved a harmonic style marked by a tremendous complexity. As Scriabin advanced along the road of musical innovations, his artistic universe became more clearly outlined and his interest in music, past and present, grew more specific. He was no longer infatuated by Chopin. Liszt's music attracted him by its lofty aesthetic and philosophical ideas, Wagner's works bore resemblance with his own experiments to combine the arts of music, poetry and drama. Scriabin had a critical attitude to contemporary Western trends in music, such as impressionism and expressionism, and their representatives Debussy, Shoenberg and Strauss. Among Russian composers he felt the greatest affinity with Mussorgsky and especially Rimsky-Korsakov, who was akin to him in spirit, but did not accept Stravinsky and Prokofiev. During the last, Moscow period of his life (1910-1915) Scriabin mixed mainly with a small circle of his close friends, although large numbers of visitors, not only musicians, came to see him in his house. 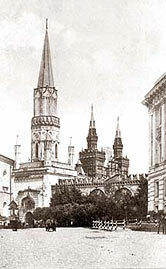 Among those with whom Scriabin maintained most regular contacts were the prominent music critics Leonid Sabaneyev and Yevgeny Gunts, the composers Alexander Krein and Fyodor Akimenko, the pianists Mark Meichik, Alexander Go!denweiser, Issay Dobrowen and the sisters Gnesin, the violinist Alexander Mogilevsky, the painter Nikolai Shperling, Doctor Vladimir Bogorodsky, and the symbolist poets Vyacheslav Ivanov, Jurgis Baltrushaitis and Konstantin Balmont. In those years Scriabin appeared widely throughout Russia. In the spring of 1910 he went on a tour down the Volga River. He also went on guest tours abroad, for instance, to England in 1914. The house in which Scriabin spent the last years of his life is situated in the centre of his native Moscow, the city he so much cherished. It is a remarkable place because here lovers of Scriabin's music can see the surroundings and hear the sounds that formed his inner world and artistic universe. Everything has such an authentic air that we feel as if Scriabin has just left the flat and can come any minute, and then we shall see his slendour figure, inspired eyes and tender smile. The doors of the Memorial Flat are always wide open. In the daytime it is ready to welcome visitors, including Soviet and foreign musicians, and in the evening it hosts recitals of Scriabin's music. 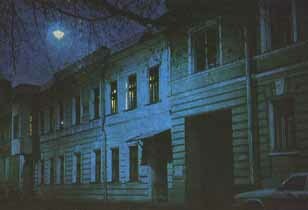 Let us enter the Scriabin Memorial Flat on the first floor of a handsome house in Bolshoi Nikolo-Peskovsky Lane (now 11, Vakhtangov Street) which Scriabin rented from Apollon Grushka, a Moscow University professor, from April 1912 to April 1915. A staircase covered with a red carpet leads up to the hall lit by an original lamp of green glass which Scriabin liked very much. Everything here is preserved just as it used to be in the composer's lifetime, with the exception of one item which is lacking, a wall telephone, a novelty of that time. and forming a transition from violet to red, rosy, rosy-red, etc. This circle corresponds to the circle of fifths in music, the red standing for C, the orange for G, the yellow for D, etc. A large bookcase, also with glass doors, at the wall in the centre contains Scriabin's library - works on philosophy, ethics, aesthetics, the natural sciences, as well as collections of poetry. The collection of printed music and books on music is not extensive. To the left of the entrance door is a series of photographs of Scriabin, his friends and relatives. A group photograph portrays Professor Nikolai Zverev and his pupils, including Scriabin and Rakhmaninov. There are photographs of the poet Jurgis Baltrushaitis and the Canadian pianist Alfred Laliberte. The door from the study leads to the drawing-room which is preserved exactly as it was in Scriabin's lifetime - the floor covered with a carpet in blue and green colours, upholstered furniture, and a cardtable. The furnishings in the drawing-room are richer than in other rooms of the flat, because it was here that the most celebrated guests were entertained. 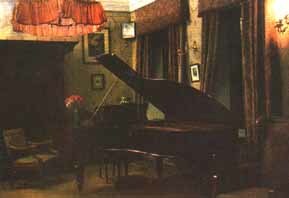 At the left-hand wall is a Becker grand piano, a gift to Scriabin from Mitrofan Belayev, presented soon after his graduation from the Conservatoire. Behind the piano on the console is Scriabin's bust executed by the well-known sculptor Serafim Sudbinin in 1908 on commission from the famous conductor and publisher Serge Koussevitzky. 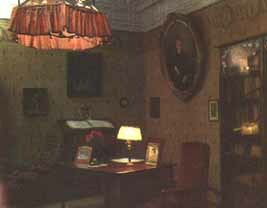 The drawing-room is connected with the dining-room in which Scriabin liked to relax. In the last years of his life he was particularly attracted to his home. One of Scriabin's contemporaries recalls: "In those years his home became very important to him. 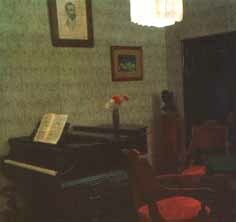 Scriabin's armchair always stood with its back to the window because he did not like direct light. In the dining-room there are numerous gifts presented to Scriabin at different times, among them, a bowl and a dish of glazed earthenware presented by a Belgian peasant woman, an embroidered strip for the dining-table, an appliqued panel in the Egyptian style. and to cast it in new forms. the spirit by means of sound.